Sugarcane is an important cash crop of Pakistan. It is mainly grown for sugar and sugary production. It is an important source of income and employment for the farming community of the country. It also forms essential item for industries like sugar, chip board, paper, barrages, confectionery, uses in chemicals, plastics, paints, synthetics, fiber, insecticides and detergents. Sugarcane production in the country has increased over time. In 1988, the area under sugarcane was 878 x 103 hectares which increased to 886 x 103 hectares in 1992 and sugarcane production increased for 36976 x 103 tons in 1988 to 38059 x 103 tons in 1992. Despite expansion in production over years, increase in the productivity per unit of area has been very low in Pakistan. The average sugarcane production in the country required static between 45-50 tons/ha, which is very much low compared to the cane production by other countries. The average yield of sugarcane in the world is around 60 metric tons/ha, while India and Egypt are getting around 66 tons and 105 tons/has, respectively. In this way, Egypt with highest cane yield in the world is getting about 142 per cent high-yield than Pakistan. India with almost similar soil and climatic conditions is obtaining about 53 per cent higher cane yield than Pakistan. As it is one of the cash crops of the country, therefore, efforts should be made to improve its productivity. As a result of these efforts, substantial improvement can take place in its yield. Improved seed production, quality control and distribution depends largely upon the availability of skilled and competent local manpower, which is present in insufficient in most developing countries. In order to increase the production of sugar cane several steps were taken by the Govt. and the sugar mill association to help formers. In past several reports/research work to increase the production were published on different process which include chemical composition as well as agricultural reforms/steps to increase the recovery and %age yield. Here in this report information is published which can guide local farmers to evaluate their cultivation system and improve it as per requirements. Sugarcane is an important industrial and cash crop in Pakistan and in many countries of the world. It is grown in tropical and sub-tropical regions of the world in a range of climates from hot dry environment near sea level to cool and moist environment at higher elevations. Besides sugar production, sugarcane produces numerous valuable byproducts like, alcohol used by pharmaceutical industry, ethanol used as a fuel, bagasse used for paper, and chip board manufacturing and press mud used as a rich source of organic matter and nutrients for crop production. Pakistan occupies an important position in cane producing countries of the world. It ranks at the fifth position in cane acreage and production and almost 15th position in sugar production. A comparison of cane yield and sugar recovery in some cane growing countries is given in the table below. Source: FAO Production Yearbook, 1998; Sugar and Sweetener, USDA, June 1997.
ii) Irrigated arid sub-tropical zone between 24N latitude to 26N latitude, iii) and temperate zone of northern Punjab and N.W.F.P. between 320 N latitude to 340 N latitude. Sugarcane is grown on an area of more or less one million hectares in Pakistan. The Punjab shares 62 %, Sindh 26 % and N.W.F.P. shares 16 % of the total area. The national average cane yield (~ 47 t ha-1) is far below the existing potential (Table 2). In respect of cane yield Sindh with 53 t ha-1 is the leading province followed by N.W.F.P. (45 t ha-1) and Punjab (40 t ha-1). Area under sugarcane cultivation increased gradually up to 1993-94 and after that it remained same. Average national cane yield also followed similar trend as of cane acreage. However, sugar recovery remained same, without any improvement, for the last many years. Trends in area under cane, cane yield, sugar production and sugar recovery in the country is given in the table below. Reasons for low sugar cane production. 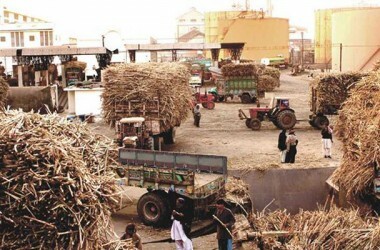 (vii) Rapid/Unplanned increase in sugarcane acreage in unsuitable areas of Pakistan. a)Lack of Research In Sugar Cane Technology. b)Unavailability Of resources for the growers. TO INCREASE OUR SUGARCANE YIELD PER UNITAREA:Our sugar yield i.e. cane yield x sugar recovery %cane is less than half of the developed cane growing countries of the world. Still it is not the lowest in the world. The goal of increasing sugar yield per unit area is difficult, time consuming and needs dedicated efforts of government, millers and the growers. Some of the measures to bring down the cost of cultivation and improve cane productivity include the selection of the right varieties, maintenance of soil health, quality planting material, nutrient management, the adoption of copping systems approach, weed management, water management, ratoon management and sound post harvest handling, according to the scientists. As Grower is the main key factor which can help to increase the sugarcane production from the field. 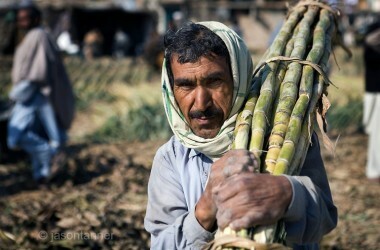 In Pakistan most of the grower doesn’t know the proper method or procedure of sugarcane cultivation. So that’s why the cane produced is of no good quality and we have less cane and sugar recovery. So it is recommended that there should be organizations who should guide the growers to increase their production. Here are some of the steps that if taken properly can improve the sugar cane production. Sugarcane is a deep-rooted crop and proper land preparation plays an important role in the development of cane root system, and achieving optimal growth of the crop. Land should be prepared by deep ploughing at least after every two years. The soil should be disked. It is very important that well-rotten farmyard manure (FYM) should be applied a month prior to land preparation. Press mud from the sugar industry is another excellent source of organic matter and nutrients. .Green manuring may also serve the purpose. Soil in the prepared field should be friable and well worked so that full germination takes place and later on plants grow without any inhibiting barriers (compact sub-soil layer). (a) When pasture, turf or grass-infested land is brought into cane production for the first time or after being out of cane production for several years. There are usually enough grubs or wireworms already established in this type of land to warrant a preventive application of insecticide at cane planting time. However, a soil insecticide application may not be needed with the second plant-cane crop if the field has been kept reasonably free of grass during the ratoon crops. (b) When cane fields are extremely grassy, particularly when cane is planted in a field that was not kept free of heavy grass infestation when fallow. Ongoing wireworm and white grub infestations will persist in grassy fields. Again, this may be needed only on light or mixed soils. Growers with fields similar to those described should consider control measures for soil insects at planting time and base chemical control on verification of soil insect pest infestations (with fermented corn baits). Based on new research data, the economic threshold is slightly above one wireworm per bait sample before planting. Soil insecticides have had a suppressive effect on beneficial predators in sugarcane studies. The selection of an appropriate planting method and schedule greatly influences crop growth, maturity, and yield. Since low temperature and moisture stress are detrimental to germination and subsequent establishment, the planting season in subtropical regions is preferably spring. But in areas where winter is severe enough to restrict growth or even kill sugarcane, planting material may only be available in autumn, thus necessitating pre-winter planting. In tropical regions, particularly where irrigation is not practiced, a sufficiently moist season should be selected for planting and establishment. There are two planting seasons: fall and spring. Fall planting starts from the first week of September and continues to mid-October in the Punjab and Sindh, while in the NWFP planting is done in October and November. Spring planting starts from mid-February and lasts until the end of March in the Punjab and Sindh. These planting times are strictly observed because late planting can reduce the yield by as much as 30 percent. September planted crop usually produces 25 to 35 % higher yield. In Pakistan Planting time of Sugarcane planting is usually carried out in autumn and spring seasons. Autumn planting is of high yield and high sugar recovery compared to spring planting. In fact, September planting gives very luxuriant growth, which is mostly vulnerable to lodging. The crop gives good appearance till June-July but is subject to lodging in July or even earlier if there are windstorms or excessive rains. Around 26 per cent of the growers plant sugarcane in October, 45 per cent in November, 2 per cent in December and 7 per cent in February. Appropriate seed rate and spacing are often ignored by farmers, with the result that the optimum plant population, which is the key factor in sugarcane production, is not achieved in the field. The seed rate and spacing between rows differ with variety. Thick-cane cultivars like ‘BL-4’, ‘Triton’, and ‘PR-1000’ require a higher seed rate and more space between the rows than thin and medium-cane varieties. Eight to nine tonnes of stripped cane per hectare for thick varieties, and six to seven tones for medium to thin varieties is sufficient to produce a desired plant population of about 0.15 million canes/ha. A spacing of 1 m between the rows of thick varieties, and 0.60-0.75 m for thin to medium varieties allows sufficient space for operations like intercultural and earthing up. Sugarcane should be planted at a row spacing of 90 cm to 1 m. Two budded double sets should be placed end to end in the furrows covered with 2 to 3 cm soil layer. About 3.2 to 4 tonnes seed (80 to 100 maunds) of thin cane varieties and 4 to 5 tonnes seed (100 to 120 maunds) of thick varieties is sufficient to plant one acre. Research has shown good yield increases in tonnage and sugar per acre when the planted row was widened from the V-furrow to the 15- to 18-inch furrow. It showed further yield increases as the furrow width was increased from 15 to 18 to 24 inches. Based on this research and the problems encountered by growers in handling furrow widths of more than 18 inches, it is suggested that growers use a 15- to 18-inch furrow for planting in 2001. Growers who can successfully handle the 24-inch width furrow are encouraged to do so. It is also suggested that the furrow opener be constructed to leave a wide bottom with a slight indentation on each side of the furrow and a slight ridge of loose soil in the middle of the furrow bottom. This opening configuration can be obtained by attaching a single disk on each side of the row opener to dig out the furrow sides and deposit the soil in the furrow middle. Some growers have found that packing rows ahead of opening will give more uniform furrows when opening with a three-row opener. To avoid water damage to seed cane, it should be placed at least 3 to 4 inches above the final water furrow or middle. In soils with poor internal drainage, the seed cane should be placed even higher above the final water furrow. Growers should be aware of the need to keep the seed cane above the area where water levels will hurt cane stands. Low row height at planting time could be a problem, especially with billet seed cane. Seed may be treated with hot water at 520 C for 30 minutes and with fungicide. This will help in better germination and the control of many cane diseases. Soaking cuttings and treating with running water for 48 hours sometimes enhances germination of old cuttings. Soaking in hot water (500C) for 20 minutes greatly enhances germination. This, however, is difficult to control at a practical level. Treatment with running water has been suggested to remove fermentation products and inhibitors from the cutting. Indoleacetic acids (IAA) or naphthaleneacetic acid (NAA) treatment enhances root growth but delays bud development. Acetylene promotes the growth of the cutting. Substances including ethyl alcohol, ammonium phosphate, complete nutrient solution, and ferrous sulphate have all on occasions proved beneficial to germination. On the other hand, at the University of Agriculture, Faisalabad, experiments have shown that soaking cane setts in water, cow urine, and 2% KmnO4 solution before planting reduced yield (Table 16.7). Table Effects of various pre-planting seed treatments on the cane yield of ‘Co.L-54’. Research on depth of soil cover over seed cane indicates that soil cover in excess of 4 inches can cause yield losses even if the excess is removed in the spring following planting. Heat-treated cane should be covered with 2 inches of packed soil. After the cane is up to a good stand and before freezing weather occurs, add an additional 2 inches of soil to protect from freeze damage. Do not cover heat-treated cane with more than 2 inches of packed soil at planting. Use healthy seed of improved varieties of sugarcane. This can increase cane yield from 20 to 25 per cent. Sugarcane varieties recommended for various provinces are given in Table 4. Around 95 per cent planted BL-4 variety in the study area. This variety flourishes very well in heavy fertile and well-drained soil with good irrigation. As the variety occupied good fields, it established high yields. New variety BF-12-is yet in the stage of multiplication, while SPSG -26 and Th-10, has just been introduced. Results show that 87 per cent planted recommended varieties and the remaining 13 per cent planted non-recommended varieties The economic life span of sugarcane variety varies from 8 to 10 years and after that replacement the variety is necessary. 3.2.10. Recommended varieties of sugarcane. According to rough estimate the farmers are using one fourth of chemical fertilizer against the sugarcane crop requirements due to non-availability as well as high cost of the same. Apart from this haphazard use of fertilizer brings no fruit and therefore the farmers do not get the crops to their expectations. The very important job getting the soil tested before the use of any particular fertilizer is not practiced in our country. As mentioned earlier fertilizer use in Pakistan is imbalanced, inadequate and improper. Most of the cane growers in the country use only nitrogenous fertilizers while others use an imbalanced combination of N and P. Use of K is almost neglected in cane crop. It is very important to use proper doses of balanced fertilizers to exploit the maximum yield potential of cane crop. Fertilizer recommendations for sugarcane for various ecological zones are given in the table below. All phosphorus and potash and one fourth N should be applied at the time of planting. It is preferable that P and K may be applied in furrows where seed setts are to be placed. Rest of the nitrogenous fertilizer may be applied in three equal splits i.e. during April, May and by mid June to February-March planted crop. It will be beneficial if N is applied in four equal splits to September planted crop besides one fifth applied at planting. In this case it may be applied during March, April, May and June. September planted crop may be given an additional dose of 20 to 40 kg N (one to two bags of urea) per acre. Recent fertilization trials have often shown yield responses to starter fertilizers applied in the planting furrow for cane planted after a fallow year as well as succession planted cane. Yield responses have been obtained in both plant-cane and stubble-cane crops with an application of 15-45-45 lbs/A of N-P2O5-K2O. Based on these recent findings, it is suggested that growers apply 15-45-45lbs/A of N-P2O5-K2O into the planting furrow ahead of planting. Applying nitrogen at rates exceeding 15 lbs/A is not recommended. As an alternative to starter fertilizer, a rotational crop of soybeans might be considered. Although a nitrogen fertilizer credit has not yet been established, the organic nitrogen from soybeans should be sufficient to get the planted cane off to a good start in the fall. The best way to determine lime, phosphorus and potassium requirements is with a reliable soil test. The soil sample must be collected properly for the test to be valid. Large fields should be broken up into smaller units for sampling purposes, and the smaller fields intensively sampled, because nutrient and pH levels often vary greatly within fields. Intensive, thorough sampling is the only way to detect these variations and adjust fertilizer and lime rates accordingly. Medium to heavy, pH 5.0-8.5. Liming required if pH < 5, or gypsum if pH > 9.5. A complete soil fertility program is essential for maximum sugarcane yields and profits. Use soil tests properly. Know the lime and fertilizer requirements for each field on which you grow sugarcane, and apply the plant nutrients according to the recommendations and soil test results. Good land preparation is a key factor in controlling weeds. For proper weed control, Gesapax combi (80 WP) may be applied @ 1.4 kg per acre in medium textured soils and @ 1.8 kg per acre in heavy soils in 100 to 120 litres of water. The weedicide should be used with the advice of the technical experts. It is very important to take care of the irrigation requirements of sugarcane, particularly in summer months. Farmers must plan their acreage to be planted under cane crop according to the available water at their farm. Keep in mind that each field should get at least 16 to 20 irrigations during the crop year adjusting the irrigation schedule according to rainfall in summer. Insect pests play an important role in reducing the sugarcane yield. The most serious insect pests are sugarcane borers, Pyrilla, and whitefly. In some areas mealy bug, black bug and army worm are also causing damage. In Pakistan exact estimates of yield losses due to insect attack are lacking but it has been reported that top borer, stem borer, gurdaspur borer and Pyrilla cause a reduction in yield from 15-20, 10-20 and 30-35 percent , respectively. In some cases as high as 80-85 percent reduction in crop yield due to insect attack has been reported. These losses in sugarcane can only be minimized by proper protection of the cane crop from insect pests with scientifically designed IPM Programme throughout the year. Pesticides are applied as and when needed in combination with cultural practices, resistant varieties and introduction and conservation of natural enemies. Pesticides will continue to play an important role in the IPM Programme. The primary difference, however, is that these products will be used selectively and judiciously. Farmyard manure should always be used when it is fully rotten. This will reduce termite attack. Trash in the field should not be kept for longer time and it may be burnt. Dry shoots attacked by the bores must be pulled out and burnt. Always cut the crop as close to the ground as possible. Use of light traps will help controlling the spread of borers killing their adults. Earthing up during May-June will help in controlling Gurdaspur borer as the adults will not be able to come out of the ridges of the soil. In case of severe attack of any insect, do not keep the crop as ratoon. Besides using pesticides/insecticides, insects could also be controlled by biological measures. These control measures are safe for environment, and hazard free. Cotesia flavips is an important larval parasitoid of sugarcane bores. Its female lays eggs inside the borer larva and after hatching, its larvae feed inside the borer larva. Adult parasitoid attack more borer larvae in the field. Trichogramma chilonis destroys the eggs of sugarcane borers. Its female lays eggs inside the eggs of borers. Parasitoid larvae feeds in the host eggs, destroying them. Epi-pyropes destroys sugarcane pyrilla. These parasitoids are mass multiplied in the laboratory and then released in the cane fields. For controlling sugarcane diseases, use healthy seed which is disease-free and preferably plant disease-resistant varieties. Treat the seed with fungicide/s before planting. The diseased plants from the field should be removed and either buried or burnt. Seed may be treated with hot water at 52 C for 30 minutes. The practice of heat therapy is becoming more common at seed-production centers to rid seed of ratoon stunting disease, grassy shoot, and leaf scale. This treatment consists of submerging the cane setts in water heated to 52 C for two hours. In the hot air treatment or the moist hot air treatment, whole cane stalks are treated at 54 C for eight and four hours, respectively. The most hot air treatment is preferred, however, because the hot air treatment injures the buds which ultimately reduce germination. When planting a new crop, it is essential to use seed from samples of the best patches of cane crop, free of disease and insect pests. Disease-free, good-quality seed increases yield by 10-15%. If the ratoon crop is properly managed, it could give higher returns than the plant crop because of savings in certain field operations and inputs. It is important to remember that ratoon crop requires 30 to 40 per cent higher fertilizers than the plant crop. The end of January to beginning of March is the best time to keep the crop for ratooning. Cane from the fields to be kept for ratoon should be cut at ground level. The sugar recovery in ratoon crop is also better and it matures earlier than the plant crop. However, remember that it has to be managed with extra efforts and care. Apply all the phosphorus and potash fertilizer plus one third of N during March. Plough the land in between the furrows to mix the fertilizer well in the soil and then irrigate the crop. Fill the gaps, control the weeds, insect pests and diseases properly. Rest of the nitrogenous fertilizer should be applied in two equal splits during April and May. Research work conducted on autumn ratooning of sugarcane at the University of Agriculture, Faisalabad, has shown that sugarcane planted in two row strips 90 cm apart not only ratooned well but also gave higher yields for each of three planting treatments than three and four-row strip planting systems. Stop irrigation 25 to 30 days before the harvest of crop and do not leave the harvested crop for long in the field. In case it has to be kept for a prolonged period, it should be covered with trash. Different varieties planted may be harvested according to their maturity. Harvesting of early maturing varieties may be started during November, mid season varieties during December and the late maturing varieties during January. The crop harvested during February-March gives good ratoon crop. Harvesting is done when the crop has fully matured and ripened. Early varieties and ratoon crops are the first to be harvested. When the stem is close to the surface, great vigilance is required in order to cut the maximum portion of the stem, which is valuable both for its weight and sugar content. The harvested cane should be immediately hauled to the mill otherwise weight and sucrose losses may occur. For this purpose, transport should be arranged in advance. The maturing/harvesting age of sugarcane crop in most of the sugarcane growing countries are more than a year (15-24 months) but in Pakistan it is an annual crop (10-12 months) and some other countries are: Hawaii (18-24 months), Java (Indonesia) (12-15 months), Mauritius (14-20 months), Australia (20-25 months),South Africa (22-24 months), Philippines (11-14 months), Cuba (12-15 months), India (10-12 months),Pakistan (10-12 months). D-1 We have not established any sugarcane breeding station of international standard. D-2- We have not taken interest in upgrading the sugarcane research station that already exists. We do not have the staff and do not provide adequate land and facilities for improvement of sugarcane research work. D-3 Efforts should be made to provide and use Ratoon stunting Disease free seed. The work on biological control of sugarcane pests should be expanded to cover all the area in all the mills. D-4 We should not have taken out the sugarcane research from breeding group. We should create a Sugarcane Research Station in breeding group. The agronomists already working on sugarcane should be asked to concentrate on selecting other superior varieties besides concentrating on just selecting drought tolerant varieties as we are short of irrigation water. They should be provided laboratory facilities for quality evaluation, so that selection of varieties on cane yield is given full attention. D-5 The crushing season in the developed cane-growing countries is kept optimum when high sugar yields are obtained. To increase our sugar yield, we should not continue with our longer crushing season, but find ways to decrease it. D-6 The sugarcane price is currently fixed as a minimum on the basis of average recovery without consideration of mill efficiency or farmer’s efficiencies. No quality payment has been introduced to match with the developed cane growing countries of the world. This action leads to a reduction of our sugar yield and increases its cost. In addition, the cane price is on average recovery of each mill without any minimum base. Thus if a cane price of Rs.40 is fixed for average recovery of 8.5%, the mills getting 7.5% recovery shall pay Rs. 35.29 for 40 kg and the mills getting 9.5% recovery shall pay Rs. 44.71. This means that Rs.0.47 shall be adjustable for increase or decrease of 0.1% in recovery from standard recovery fixed as 8.5%. D-7 There should be a zoning system. The farmers should not be free to sell their produce to any mill they like. The present action of de-zoning should discontinue. By this action the development work that was being done by mills has greatly been reduced. The mills would not like to invest their money on development of the farmers unless they are sure to get their cane delivered to their mill. This has also encouraged the middleman business, which has increased the cost and decreased the quality of cane delivered. This has also increased the after harvest losses and transport expanses. D-8 The water rates for sugarcane crops are charged on uniform basis. The farmers getting high yields are using more water than the farmers getting lower yield. Therefore the system should be introduced to charge water rates in relation to yield groups might be very high, high, average, low, and very low. This will provide some satisfaction to the farmers getting low yield and very low yields. Also By Taking Following Steps We Can Also Increase The Sugar Cane Production. 1- We should immediately establish a sugar cane breeding and research institute of international standard near our seacoast where natural flowering and production of true seed is possible. The breeding station should have all the necessary departments like physiology, agronomy, engineering, statistics etc. Technical help may be taken from friendly countries experts. We should take special care in selecting our staff and getting them fully trained for their specified job in the institute. This institute should work as a main center for our country as is coimbatore in India. It should have good substations with competent staff end facilities for work. It should have sufficient area and irrigation water for future expansion also in addition to immediate need. We should have one good substation in N.W.F.P. upper Punjab, lower Punjab and upper Sindh. These substations should also have proper facilities for selecting varieties and for producing of disease free seed especially for RSD & Mosaic with proper hot water treatment and look after. Special care should be taken for selection of site and provision of area and other facilities. These substations should have proper facilities to coordinate with the sugar mill is solving their cane problems, provision of training to their staff, farmers and the staff of cooperative societies of their area for improvement of sugar yield. These substations should provide RSD free seeds to each mill and coordinate in its proper multiplication and look after. The seed should be sufficient to cover full area in 3-4 years in each mill. Special attention should be given to improve area and yield Ratoon crops. Similarly special care should be given for selecting varieties, on the basis of sugar yield at their maturity. Special care should also be given in selecting verities for early, mid and late crushing as per crushing season of the mill concerned. 2- The sugar cane research department in all the provinces should be created in breeding group and the staff of agronomy should remain in agronomy group. The agronomy group should be expended to cover all the crops. 3- Our crushing season should be reduced to match with the best cane growing countries having similar climate. We should fix our cane-crushing season for 120 days from 15th November to 15th March. Variety performance should be evaluated for each month on the basis of sugar yield per unit area, and selection should be made for early, mid and late season crushing. We don’t need to start early for disposal of Ratoon crop. The developed cane growing countries have more Ratoon crops than what we have, but they crush it only in the optimum season. We should create cooperative societies for development and marketing of sugarcane crop. This shall help in solving many problems and shall greatly help in increasing the sugar yield. The mills can’t give full attention to the small framers. Through cooperative societies it shall be possible for them to extension workers. It shall also help in elimination of middleman. The staff of the cooperative societies and their farmers should be given practical training in all aspects of crop production including land preparation, planting of seed or nursery raised plants from RSD free seed. With capacity to achieve the desired stand quickly and to stop tillering when proper stand has been achieved, by proper earthing up, and for proper fertilization and look after of the crop to get optimum growth and weighty of stalk and to mature at the right time. Thus best crop production technology, use of balanced fertilizers (N.P.K.) with micronutrients like Boron, Manganese and Zinc, and plant protection shall become a common practice. These cooperative societies shall greatly help in minimizing the yield and quality difference from farmer to farmer. This is very much needed to improve our sugar yield per unit area. 4- quality payment is a basic requirement for improvement of sugar yield. All the developed cane growing countries have used it as best tool for improving their cane sugar recovery. We must adopt it immediately. We have to first fix standard mill efficiency on the basis of which recovery of each truck or trolley shall cane to be fixed for payment. We can fix the standard efficiency as CCS% cane x 0.85. This should be for full season and for all the mills. Standard recovery and its price have to be fixed. The next step would be to fix a standard curve for the crushing season fixed for each mill or group of mills situated under similar climate growth and maturity. This should provide average CC% cane x 0.85 (or other factor fixed) for each day, on the basis of which payment shall be evaluated every day for each supply. It shall be better to fix low recovery base as on this most of the farmers would get premier and deduction shall be less. This may be fixed at 7.5 % recovery on standard efficiency. The cane price should be fixed as share in the sugar recovered on the base of standard efficiency. This is varying in various countries and is up to 70% to 75% to the grower. We have about 60:40 ratio with the present system. It is suggested that ratio of 65:35 may be fixed on standard efficiency. The mills should provide ware house facility to the growers. It should be free for the crushing season and may be on small payment after the season. By this, only the mills shall not suffer due fall in sugar price but loss shall be shared by growers also. For quality payment special agreements have to be made by the mills growers and the government. Facility for each evaluation of each supply of farmer or cooperative societies shall have to be provided. The growers and millers shall have combined team for sampling storage and analysis. Whereas govt. shall have to provide technicians to solve any dispute occurring for sampling or analysis or evaluation for payment etc. a) stop mixing of fresh and stale cane. b) Shall try to supply only fresh cane. c) Shall stop irrigation the crop before harvest. Instead, shall agree to stop irrigation a month or so before harvest. d) Shall agree to remove immature tops for use as fodder and supply clear cane. e) Shall agree to use only balanced fertilizers and stop the use of nitrogenous fertilizers in the late season to increase weight of cane. f) Shall agree to use more seed and stop late tillering. g) Shall agree to use only RSD free seed of recommended varieties for early, mid and late supply. h) Shall agree to stop late planning or mixed cropping with cane. i) Shall agree to take good care or prevent the crops from pests, disease and lodging. j) Shall agree to work in a cooperative way and become member of cooperative societies for sugar cane development and marketing. 5- Zoning system should be re introduced. The zones for each will should be fixed in a way that total mill requirement is met and the mills should not be allowed to obtain from outside. They may be allowed to obtain cane from outside only after finishing the cane of their zone. The mills should be provided incentive in increasing their milling capacity if they improve the cane yield of their zone. There is scope if improving yield by about 100%. Thus they should be provided incentive accordingly. The mills can improve their income by development work for quality. There is scope of improving recovery to over 11 %. Wit the standard efficiency fixed, the mills can increase their income. Some other incentive may also be provided for improvement of efficiency. 6- Fixation of crop intensity shall provide incentive to all the farmers who can’t increase their area. They shall be forced to increase their yield to cope up with the target of their over all cane production. It is, however, very necessary that water supply is properly distributed, honestly on regular basis. It will be the best policy to supply water through meter, which cannot be misused by influential big farmers or jageerdars. If the irrigation system is set right on a honest footing, the yield differences of small Farmers and big influential farmers shall greatly come down and improve our sugar Yield. It is also necessary that our catchments areas are properly looked after to stop erosion and our dams are maintained at their proper depth and original capacity. Membrane filtration for process improvement in sugar mills. TECHNOLOGY ADOPTEDDouble sulphitation process is employed for production of plantation white sugar which has a pol of 99.8% Government have laid down quality standards in terms of grain size namely large (L), medium (M), small (S) and in the colour series of 31, 30 and 29 . In terms of ICUMSA, it corresponds to 100 to 150.Automation of process control systems and continuous pans. High pressure boilers, efficient turbines generating power. Installation of bagasse dryers for fuel economy and energy conservation. Modification of process for production of refined sugar. use of combine Harvesters . In hot liming, the cane juice is preheated to 180 °F to 200 °F. It is then heated quickly, under pressure, to 220-225 °F. When the pressure is released, the juice begins to boil violently, or flash, and the lime is added. In some factories, the lime can be added just before the flashing stage. In intermediate liming, only 30-50 percent of the juice is preheated. The lime is added when all the juice is about 150 °F, and then it’s flash-heated to 220 °F. Drip irrigation is the most efficient method of irrigating. While sprinkler systems are around 75-85% efficient, drip systems typically are 90% or higher. What that means is much less wasted water! For this reason drip is the preferred method of irrigation in the desert regions of the United States. As we have seen that from all the above mentioned facts that the major cause of low sugarcane production is improper use of agricultural methods. And also from pervious data we can see that as we have increased our sugar production per acre our cane yield and sugar recovery has decreased. This is due to improper use of cane variety and cultivation process. So if we want to increase the quality of sugar cane so we need to fallow the proper way as per described by the Agricultural Department. 2001, By Benjamin L. Legendre, Ph.D., Specialist (Sugarcane), Louisiana State. The sugar industry plays a pivotal role in the national economy of our country,By Dr.
S.M. ALAM and M.A. KHAN, Nuclear Institute of Agriculture, Tandojam, Pakistan. www. PAKISSAN.com/ Sugarcane Tissue Culture Technology.htm. Sugarcane Breeding Institute, Regional Centre Karnal, India. Sugar Processing Research Institute, Inc., New Orleans, Louisiana, USA. Sugar-cane production on decline,By Dr Ali Muhammad Khushk. Molecular Approaches to Genetic Development , Annual Report 2002. 9.Recovery of Additional Sucrose with An Integrated Program Using Biocide andDextranase to reduce Undetermined losses, Midland Research Laboratories, Inc.